Digirette is looking to turn the convenience store entry-level vape on its head. Last week, I published a piece about proper subohm setups showing up in places like Walgreens. 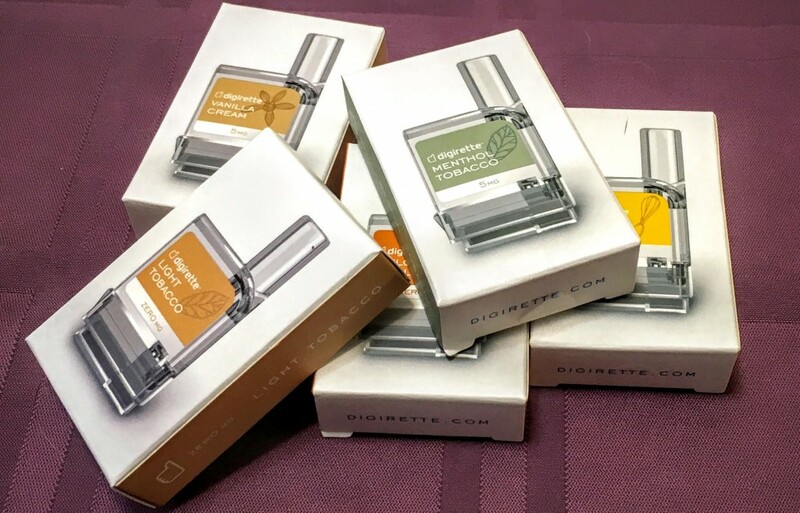 The new E Vapor System from Digirette also wants newbies to vape clouds, but they’re taking an entirely different approach to the idea. Read the rest of the review to find out more. 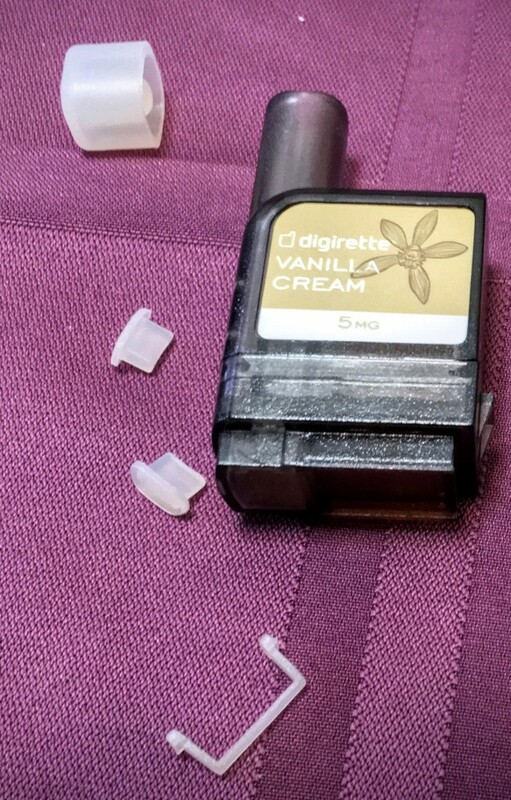 Disclousre: I received this product at no charge for review purposes. The first thing you probably noticed about Digirette’s vaporizer is that it’s a proprietary “closed system” vaporizer. Rather than having some sort of tank or cartomizer, this system uses small tanks filled with 5ml of e-liquid (available in multiple flavors). The tanks have a proprietary connection and contain the heating element and cotton wick as well. Clearly, this is a setup that won’t appeal to seasoned vapers. But, that’s not the target market of this device. 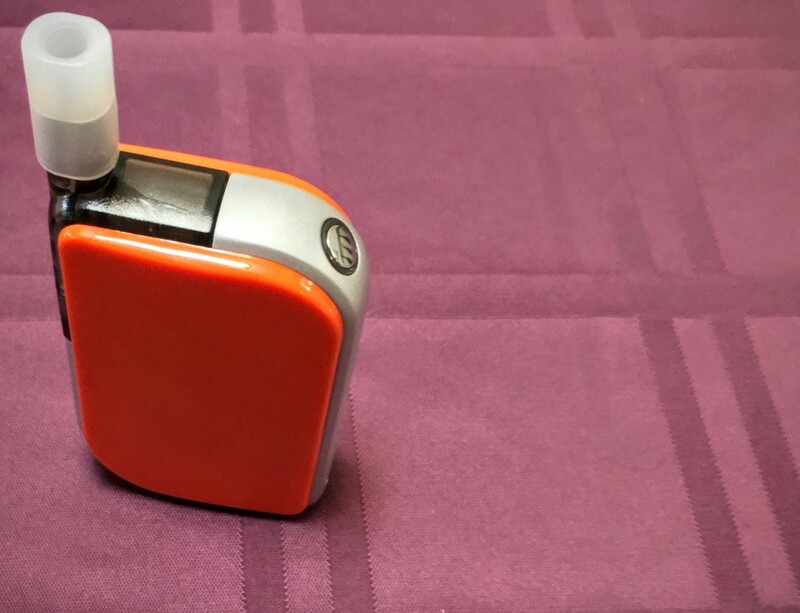 Rather, the company wants to offer something to current smokers that is as simple to use as a cig-a-like but offers an experience closer to “real” vaping. I’m not a big fan of closed systems since they tend not to be as cost-effective. That is certainly the case with the Digirette. A new kit which includes the vaporizer and one tank will set you back about $50 and each replacement tank is around $7. More traditional setups can be had for less, and more importantly, refilled for much less. But, this is the retail store market, which has always been on the expensive side, so it’s probably not something that type of buyer would necessarily balk at. Chances are pretty good that this will also be a good transitional device getting new users to switch to more advanced models, increasing their odds of switching away from combustible tobacco products. Other than the closed nature of the product, the E Vapor System has a lot going for it. As used to I am at super-heavy mods made of steel and other products, I have to say I really enjoy the lightness of the Digirette vaporizer. It’s easy to put in a pocket and go. The Digirette was designed to be roughly the size of a pack of smokes, making it easy for smokers to carry around like they do their cigarette box. Personally, I found the size of the vaporizer to be just a tad wide. I never could get what I felt to be a comfortable grip on the body. When I held it like I do with other APVs, I found my fingers blocked the air holes on the tank. Button placement also felt a little off, like there wasn’t a good natural resting place for my finger until I started holding the thing “backwards” as compared to the orientation of my other vaporizers during use. The button also serves as the only display on the Digirette vaporizer. An LED ring surrounding the button indicates the charge status of the battery going from green to white to red. Not only does that light display charge status, but it’s also used for output. Unlike most APVs on the market, this device doesn’t output a constant voltage. Old-timers will be familiar with the regulated battery concept that’s in use here. Electronics inside the device ensure the output charge never goes above or below certain levels, but the output depends on how much charge the battery has. In simpler terms, the lower the battery power, the lower the vapor production is likely to be. Less power going to the tank translates to less temperature to make vapor. The tank itself is an interesting design. 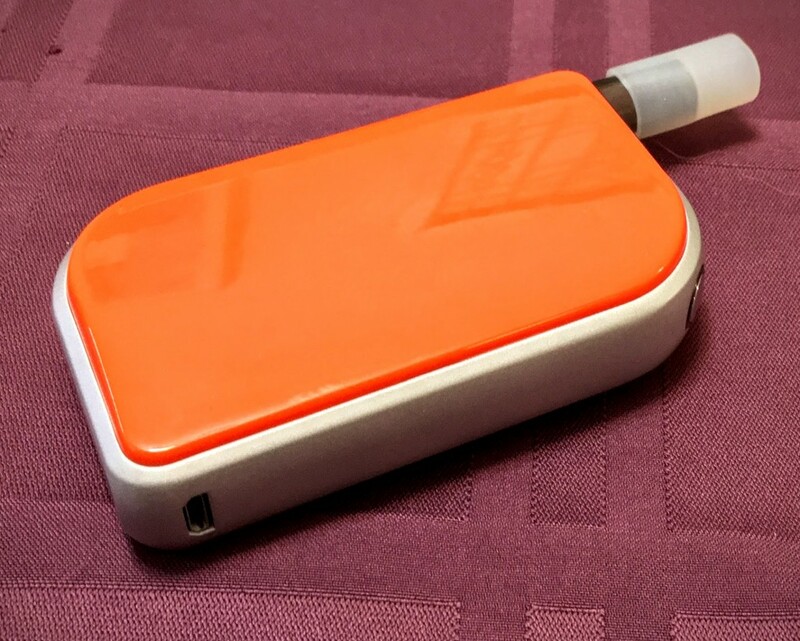 It’s a sort of square cartridge that’s filled with e-liquid. The one annoying thing is that there’s no fewer than 4 rubber plugs that have to be removed. There’s a cap on the mouthpiece. two air hole plugs and finally a little rubber thing on the bottom to protect the battery contacts. Interesting note about the air hole plugs is they also serve as a low-tech airflow control. You can remove just one of the plugs for a tighter draw and lower airflow. Remove them both for an airy direct-to-lung kind of experience. Leave them both in… and well it doesn’t work, you need airflow of some kind. The company did say that they are working on a more elegant airflow system in future versions of the product. Some users might find the stubby plastic mouthpiece that’s part of the tank to be uncomfortable. Fortunately the starter kit comes with a six pack of silicone tips you can use for a little more comfortable mouthpiece, or to share the vaping experience with your friends and not their cooties. When you bring this all together from a performance standard, the Digirette is nothing short of remarkable. Naturally there are devices that can outperform something as simple as this device, but the E Vapor System is no slouch. It’s easily possible to produce very respectable clouds without much work at all. Even when the light drops from green to white, I’m still puffing away like a train. Now compare this to your typical gas station offering like a traditional e-cigarette or the eGo tank systems you typically find. It is nothing short of mind-blowing in comparison. I actually wonder if the Digirette might put off new users because it produces too much vapor as compared to smoking. The company behind the Digirette is very interested in breaking into the c-store market and improving their products, I think they might have a good chance at making a difference. Sure, I’d like to see a refillable version of their tanks one day and maybe a few tweaks to the ergonomics of the vaporizer, but it’s by far a good thing for the novice vaper. Digirette products are also available online for purchase at Digirette’s website. PREVIOUS POST Previous post: Walgreens Carries Subohms, Have Things Gone Too Far? NEXT POST Next post: Could Latest eCig Explosion Lead to Backdoor Ban?